This durable filter comes with a 155 mesh screen for keeping dirt and particulates from clogging drip emitters. This model has a FHT (female hose thread) swivel inlet connection and a MHT (male hose thread) outlet connection. 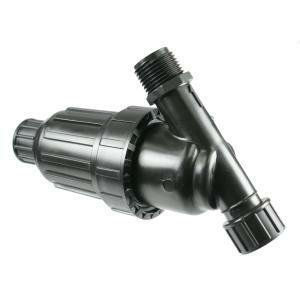 Convenient for any drip irrigation system connecting to your garden hose spigot. Filter canister has a 3/4" hose thread removable cap for easy flushing and comes apart to remove filter screen for periodic cleaning. Arrow marking direction of flow for easy installation. Can be installed vertically, horizontally or inverted as long as directional flow is followed. Note: This filter is not designed for constant pressure and must always be placed downstream of the timer or valve.